Neighborhood Opportunity and Storytelling Neighborhood Change — Willow Lung-Amam, Ph.D. Neighborhoods of concentrated poverty often have limited educational, employment, and other opportunities that affect residents’ economic and social mobility. My research has shown how community engagement in mapping neighborhood opportunity and regional planning can help to bridge opportunity divides. In recent years, opportunity maps that index indicators of social and economic equity have become popular tools to assess the spatial distribution of metropolitan resources. During the Obama administration, many communities began using opportunity maps to demonstrate compliance with the “affirmatively further fair housing” (AFFH) provision of the 1968 Fair Housing Act. Yet little research has examined the utility of these maps to policy- and plan-making or their underlying methods. 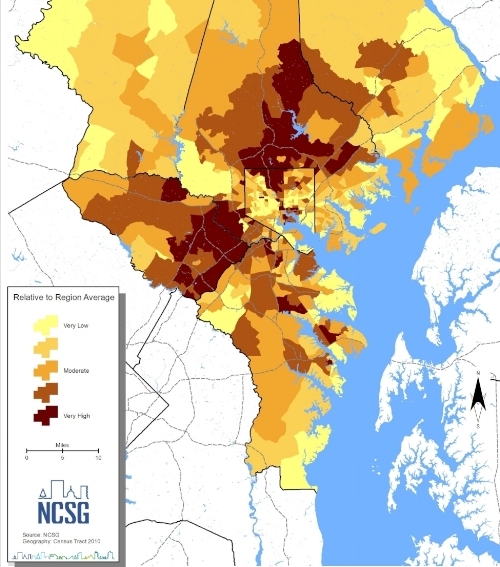 In City and Community and an op-ed in the Baltimore Sun, my NCSG colleagues and I showed how groups in the Baltimore region define opportunity across race, income, and geography. The findings underscore the importance of community engagement in mapping and the need for tools to better capture the complex ways that communities perceive of opportunity. Our research also examined how opportunity maps were used to engage communities and advance equity plans and policies in 6 U.S. metropolitan regions, including an in-depth study of Baltimore’s Sustainable Communities Initiative (SCI) regional planning efforts. In articles under development, we show how opportunity maps have helped advocates push for change as well as the political and other barriers that limit their utility in advancing regional equity policy. In light of the Trump administration’s efforts to roll back AFFH enforcement, research on local and regional efforts to use these tools to promote equity planning is critical. My research has also helped to advance the practice of opportunity mapping. Three reports I co-authored on opportunity mapping and community engagement appear on Enterprise Community Partners’ Opportunity 360 site, including Towards and Equitable Region: Lessons from Baltimore's Sustainable Communities Initiative, Engaging Communities around Opportunity through Story Mapping and Story Mapping in Action: Engaging an Immigrant Community in Planning for a New Light Rail. It also includes a host of community engagement tools and case studies that were created in by Place Matters, in partnership with NCSG. Enterprise is a leading national affordable housing foundation and developer. Their Opportunity 360 platform offers communities across the country mapping tools and other resources to facilitate asset-based community development. For the research on the Baltimore regional plan, I participated in an Enterprise webinar, contributed to an op-ed in Baltimore Sun, and appeared on a Baltimore radio program to discuss our findings. I also collaborated with Enterprise as part of an NCSG team to develop the Prince George’s County’s Comprehensive Housing Strategy that applies an opportunity-based framework.